The Canon 24-105mm lens is an excellent lens. I still own mine because I find it really hard to let go of my IS and the extra reach of the 105mm. Sadly Canon chose to shorten this lens to a 24-70mm version and give us IS on a f/4 lens instead of the f/2.8 where we really wanted it. I’ve reviewed the Canon 24-70 f/2.8L II USM lens and it was the sharp lens that we were all hoping it would be, but it’s lack of IS has proved to be a challenge in the real world. As a result, I’m going to give this new f/4 lens a try to see if I should forgo 2.8 in favor of getting IS back. I’ve got the Canon 24-70mm f/4L IS USM in my hands and am reviewing it now, so stay tuned to see which one I end up with! and don’t forget to check out my article entitled Comparison: Canon 24-70 f/2.8L II vs 24-105mm f/4L IS vs 70-200mm f/2.8L IS II–70mm Test. Was this even announced by Canon? I was surprised to see it shipping without any major fanfare... I look forward to your reviews, and like you I am surprised at their design choice, it certainly would seem this is neither a direct update to their old 24-105mm, nor to the newly release 24-70mm. PS. I think a typo snuck in to your post, since it references a Canon 24-70 f/2.8L IS II USM lens. Yes, Canon announced it but it was during the holiday season. They also did something they haven't done very well lately - they actually got it in customers hands quickly after announcing it. RE: The 24-70 2.8 II - that was no typo. The new 24-70 2.8 II is a lens that this one will be compared against because they are both new Canon lenses that are super sharp, but the question becomes - is the IS improvement worth the 2.8 -> 4.0 difference? I'm still asking myself this question and have this new lens on the way to compare to my Canon 24-70 2.8 II and 24-105. 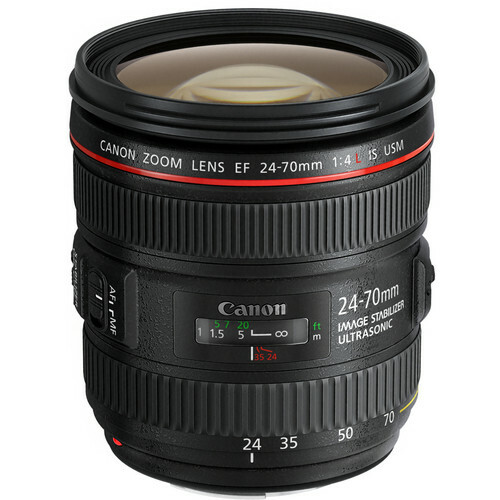 "Canon 24-70 f/2.8L IS II USM lens". It confused the heck out of me as you were talking about the lack of IS. Thank you for your work. I love reading your blog. Grrr, thanks for pointing that out. I missed that and when Peter pointed it out I missed the IS in his reply. Thanks for speaking up!